The Volvo XC60 is one of the safest cars ever made, according to a panel of expert judges who have declared it winner of the What Car? Safety Award. 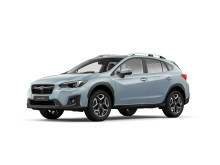 The five-door SUV impressed with the unrivalled protection it offers to occupants in the event of an accident. Crucially however, the Volvo XC60 is also fitted with a host of pioneering Advanced Driver Assistance Systems (ADAS designed to avoid crashes occurring at all. 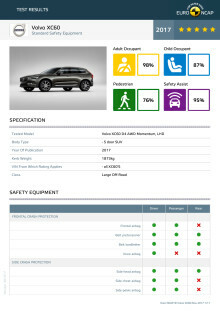 Key Volvo XC60 safety technologies include: AEB systems which operate at a variety of speeds and driving environments, and can detect pedestrians, cyclists and even large animals; a suite of Lane Support Systems to alert the driver when the car is drifting and actively steer to avoid head-on collisions; Blind Spot Indication Systems; Rear Cross Traffic Alerts; and a Run-Off Road system. 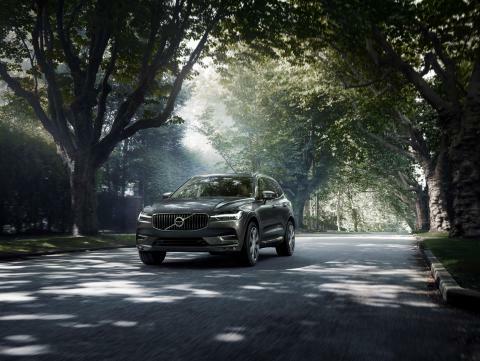 As a result, Euro NCAP awarded the Volvo XC60 a score of 95% for its safety assistance features. 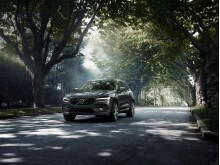 The Volvo XC60 was not the only vehicle to receive praise for the levels of safety offered to drivers. 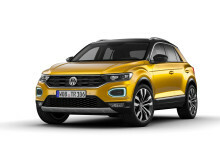 Two other new vehicles were highly commended by the panel of expert judges – the Volkswagen T-Roc and the Subaru XV. Will carmakers follow Volvo, VW and Subaru’s lead? Today, standard-fitment of AEB on new cars has reached 61%. But, only three of the SMMT’s 10 best-selling cars in 2017 had AEB as standard across all trims, while number one seller the Ford Fiesta only offers this potentially life-saving technology as an option. In 2018 2.6 million cars have standard-fit AEB, approximately 6.9% of the 38 million cars on the road today. 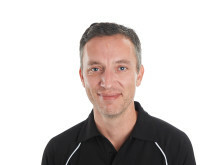 “Standard-fitment of AEB is still not at the levels it should be. Jaguar Land Rover is the only carmaker amongst the top 10 best-selling brands to fit AEB on all new models. 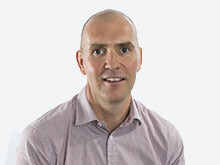 While standard-fit AEB penetration for Ford, the top selling brand in the UK, stands at just 7% today,” says Avery. 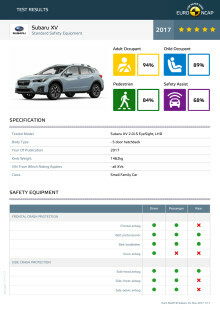 Make sure it’s a five-star car: Head to Euro NCAP’s website and check the safety score of any car you’re considering. If it hasn’t earned a five-star rating, don’t buy it. Demand AEB: Understand whether the car has AEB as standard or as an option. If it’s not available, score that car off your list. If it’s only optional ask the dealer to fit it as part of the sale. If they won’t, take your business to one who will. 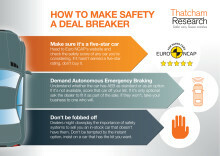 Don’t be fobbed off: Dealers might downplay the importance of safety systems to sell you an in-stock car that doesn’t have them. Don’t be tempted by the instant option, insist on a car that has the kit you want. ACC (Adaptive Cruise Control): By maintaining a safe gap to the car in front adaptive cruise control can help cut incidents caused by tailgating. As with AEB, ACC can use cameras, radar or lidar to determine the gap to the vehicle in front. Unlike normal cruise control, adaptive systems use the radar (or sometimes camera) to maintain a safe distance between you and the car in front regardless of your set speed. Drivers that use ACC have been shown to have fewer collisions since it is suggested that it helps to condition the driver to maintain safe driving distances. 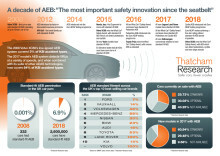 AEB (Autonomous Emergency Braking): Autonomous emergency braking systems can detect an impending crash and slow or stop the car if the driver fails to act. Systems can use lidar, radar, camera or a combination of these to monitor the road in front of the car. If a vehicle in front slows suddenly the system will alert the driver and, if they fail to act, apply the brakes automatically. Some systems only work at lower, urban speeds while others function up to motorway speeds. Real world data shows that AEB is reducing the most common crash type, the rear end collision, by 38%. ADAS (Advanced Driver Assistance Systems): Car safety technologies designed to avoid or mitigate accidents and keep the driver engaged in the task of driving. BLIS (Blind Spot Indication System): This technology is designed to stop drivers moving into the path of an overtaking vehicle that is hidden in the blind spot. It commonly uses radar, to sense the presence of another vehicle including motorcycles and will give a visual or audible warning - usually a light in the wing mirror or door pillar - to alert the driver. Some systems actively intervene to prevent the driver moving into the other vehicle's path by braking or steering back into lane. Cyclist AEB: Vulnerable road users, including cyclists and pedestrians account for 30 per cent of all fatalities or serious injuries across the EU each year. The smaller size and more erratic movement of cyclists compared with cars makes them harder for standard AEB systems to track. As with pedestrian AEB, cyclist detection systems use better sensors and algorithms to detect the presence of cyclists and respond to their movements. LKA (Lane Keep Assist): Lane Keep Assist systems will gently correct a vehicle’s steering to ensure the vehicle stays within the white lines and road edge. Not to be confused with Lane Departure Warning systems that only warn the driver, LKA systems actively but subtly steer the vehicle back into lane. With LKA, a front-facing camera tracks road markings to determine if the vehicle is straying out of its lane and potentially off the road or into the path of another vehicle. Six per cent of A road crashes are head-on collisions where a vehicle has left its own lane. LDW (Lane Departure Warning): LKA’s less effective and less popular younger brother, LDW will only alert the driver when it is changing lanes without indicating. Constant beeps and bongs from the car when driving means that the best LDW systems are subtle and do not irritate the driver into switching them off. Pedestrian AEB: Detects potential collisions with pedestrians and intervenes to reduce or avoid the impact. With 5,588 pedestrians killed or seriously injured on UK roads in 2016 the widespread implementation of pedestrian AEB could have a dramatic impact on reducing road casualties. Because of the particular shape and movement of pedestrians, pedestrian AEB must be much more sensitive and discerning. RCTA (Rear Cross Traffic Alert): Using the same corner sensors as the Blind Spot Warning systems, this monitors an approaching vehicle from the side and protects the driver from reversing from a parking space into the path of another vehicle. The systems tend to warn the driver but some actively brake the vehicle to prevent a collision. Reverse AEB: A fifth of accidents involve reversing into another car and insurance claims for such incidents cost £1.7 billion annually. Far more seriously, not being aware of what is behind you can result in serious or fatal injuries to children, pedestrians and cyclists. Reverse AEB goes a step further than warning beeps, actively applying the brakes of the car if the driver fails to heed the alerts. TAP (Turn Across Path): Using the same corner sensors as BLIS, this monitors an approaching vehicle from the side and protects the driver from reversing from a parking space into the path of another vehicle. The systems tend to warn the driver but some actively brake the vehicle to prevent a collision.